Today we still applaud the wealthy who contribute to good causes, but somewhere along the line the idea that success in any way obligated one to do so was severed from the express “values” of American capitalism. 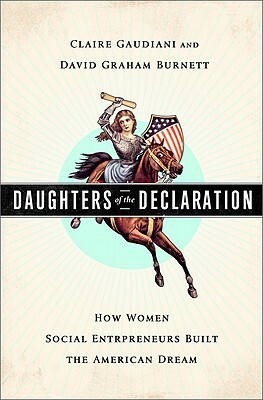 Husband-and-wife team Claire Gaudiani and David Burnett’s worthy and eye-opening “Daughters of the Declaration” reminds us that it was not always so. In fact, they argue, our Revolutionary founders believed—along with the religions in which they invested themselves and the Scottish philosophers who then inspired them—that virtue was the highest aim in life, which the new republic should help foster. And from those who benefited the most financially from the new political organization, much was expected: a democratic “noblesse oblige” to help lift others. The authors acknowledge that in the beginning only a small proportion of Americans—men, and property holders at that—enjoyed the full benefits of citizenship, but insist that both the Declaration of Independence and the Constitution looked toward a broader enfranchisement. Even though, for example, women could not vote and had restricted property rights, they were seen as critical in educating children, especially in the virtuous character of the good citizen. From the beginning—and to an astonishing degree, by the authors’ account—ambitious, public-spirited women saw a larger role for themselves, forming critical nonprofit organizations to do good. Moreover, these leaders did not restrict themselves to forming, financing and sustaining “charities”—organizations providing immediate assistance to the poor or sick, for example—but also established groups seeking to increase the social value that enlarged the “American pie” for everyone. She showed business acumen in quickly using her deceased husband Frank Leslie’s national newspaper to earn profits, but according to the authors her greatest contribution to “social profit” may have been bequeathing $2 million to the women’s suffrage movement.